Orcs are creatures mostly interesting to me. There are several issues concerning them, namely, their origin (dubious thing, you know, with Tolkien changing his mind about it), do they have free will, and, in this case, are to be considered sinners on their own behalf or just puppets of Morgoth/Sauron and therefore blameless, what is their lifespan etc. Most of what I ever had to say about the subject is placed at The Barrow Downs, but is scattered in several threads. I'll try to gather all there is worth of posting as a separate thread and present it to your attention. First installment will deal with so called (by me usually) Twelve Orkish Statements, referred to as TOS further on. 1. Orcs have different origins, including beasts, Men and Elves. Great orcish leaders (Boldog) were orcish hr�ar inhabited by corrupted Maiar. 2. Those of beast origin need direct control of an evil mind (i.e. Morgoth or Sauron) to act with some purpose, otherwise they "stray aimlessly". 3. The Elvish and Mannish orcs are capable of independent action in those "good old days", when Sauron is out of the stage. 4. The Elvish and Mannish orcs definitely have f�ar. 5. The Elvish-orcish f�a has the right of Elvish ones to go to Mandos, therefore having the possibility to repent. The decision to rebuild its hr�a lies with the Valar, though usually the f�a is supposed to be kept in captivity till the end of the World. On the other hand, it has the right to refuse the summons and remain in the Hither Lands as a houseless ghost or wraith. 6. A Mannish f�a has to leave the confines of the world, as human f�ar do. 7. Orcs are capable to be interbred with Men even in the third age, thus acts Saruman, as well as Sauron, producing a new type of "man-orc". 8. Beast-orcs must be considered innocent in a way, for they are just tormented and perverted animals, Kevlar with no free will. 9. Elvish and Mannish orcs possess free will, as all the Children of Eru, however it is suppressed by thehorror of Dark Lord, therefore they are not irredeemable and must be considered sinners, even those natural born ones, thus being distinguished from beast-orcs. Elvish and Mannish orcs know the Good from the Evil and appreciate the good (see Shagrat and Gorbag converse, where the "Elvish trick" of leaving companions is evaluated to be bad, and generally ascribed to the other side). 10. All Orcs hate the Dark Lord for what was done to them, but the hatred is suppressed by horror, and they hate peoples of free and good will still more. 11. Elven-Orcs especially dislike the Elves proper, and receive the same feeling from the other side. 12. Elven-orcs have the usual Elven longevity, therefore , for instance, some of them can recall and recognize items of several thousand years of age (Orcrist and Glamdring recognized by orcs in The Hobbit). "Yet this is held true by the wise of Eress�a, that all those of the Quendi who came into the hands of Melkor, ere Utumno was broken, were put there in prison, and by slow arts of cruelty were corrupted and enslaved; and thus did Melkor breed the hideous race of the Orcs in envy and mockery of the Elves, of whom they were afterwards the bitterest foes"
Mark the following points: 1. Opinion (not precise knowledge) is ascribed to the 'wise of Eress�a' (cf Treebeard and his opinion concerning trolls), not to the author himself. 2. Orcs are described as 'bitterest foes' of Elves. In case they are themselves perverted Elves, the situation is psychologically fitting (Elves seeing in Orcs what they themselves might have become, Orcs seeing in Elves what they were ripped of). Point one plays against the Elven origin theory, point two for it. Not having 100% conclusion, I may assume that at least some (even if a very limited number) Elves were used in the breeding of Orcs. If Morgoth was capable of twisting Elves (see assumption above), then he must have been capable of doing the same to Men. Immediate objection: Men haven't yet been awoken while Orcs were already in existence. On the other hand, we see Men used to be interbred with Orcs in later time (Saruman). Conclusion: Men might have been used by Morgoth to produce Orcs, yet were not at a time, and were added up to Orcish genetic soup in later ages. This is backed up by JRRT's direct statement: "Orcs are beasts and Balrogs corrupted Maiar" from 'Late Writings', History of Middle Earth (further HoME) volume XII. I will come back to the source of the quote when I have to deal with free-will. Those of beast origin need direct control of an evil mind (i.e. Morgoth or Sauron) to act with some purpose, otherwise they "stray aimlessly". "But the Nazg�l turned and fled, and vanished into Mordor's shadows, hearing a sudden terrible call out of the Dark Tower; and even at that moment all the hosts of Mordor trembled, doubt clutched their hearts, their laughter failed, their hands shook and their limbs were loosed. The Power that drove them on and filled them with hate and fury was wavering, its will was removed from them; and now looking in the eyes of their enemies they saw a deadly light and were afraid." "As when death smites the swollen brooding thing that inhabits their crawling hill and holds them all in sway, ants will wander witless and purposeless and then feebly die, so the creatures of Sauron, orc or troll or beast spell-enslaved, ran hither and thither mindless; and some slew themselves, or cast themselves in pits, or fled wailing back to hide in holes and dark lightless places far from hope." Further it is said that some Men, on the other hand, gathered for the last stand against the Captains of the West. 1. 'All the hosts of Mordor' - i.e. not only orcs, but Easterlings, Haradrim etc. So, Sauron is affecting not only Orcs, but Men; and his will imposed causes them to be furious in battle and fearless. 2. Only Orcs and the like are directly controlled by Sauron's will, and men are just infuriated and made fierce by it. In both cases independent 'fear' on the creature's part is a sign it possesses 'life of its own'. Is it a contradiction? For in case the dwarves' fear indicates that they are 'adopted' by Eru and given the will of their own. Does it mean that (beast)orcs have free will as well? (Free will in general will be discussed in entry 4). I think not, for the 'life of their own' is a essence of kelvar (animals) as well as of 'Speaking Peoples', though it does not imply they have fear and posses the free will. The Elvish and Mannish orcs are capable of independent action in those "good old days", when Sauron is out of the stage. orcs are capable of independent action. "Oho! So they haven't told you what to expect? They don't tell us all they know, do they? Not by half. But they can make mistakes, even the Top Ones can." Gorbag is criticizing if not Sauron himself, yet his mostly "beloved" Nazg�l. How is it possible, especially in the light of the above discussed 'direct control of Evil'? "I think it must be assumed that 'talking' is not necessarily the sign of the possession of a 'rational soul' or fea. The Orcs were beasts of humanized shape (to mock Men and Elves) deliberately perverted I converted into a more close resemblance to Men. Their 'talking' was really reeling off 'records' set in them by Melkor. Even their rebellious critical words - he knew about them. Melkor taught them speech and as they bred they inherited this; and they had just as much independence as have, say, dogs or horses of their human masters. This talking was largely echoic (cf. parrots). In The Lord of the Rings Sauron is said to have devised a language for them." "Morgoth not Sauron is the source of Orc-wills. Sauron is just another (if greater) agent. Orcs can rebel against him without losing their own irremediable allegiance to evil (Morgoth)." That says it all I think. As an assumption: those orcs who had a human (and mostly rare, yet still possible, Elvish) strain in their blood still more were capable to act independently. The elvish and mannish orcs definitely have f�ar. Well, the above stated is logical in case [Elves and] Men were used to produce orcs. Though Elvish origin, as was stated above, is improbable, men are proven to be used in orc production. 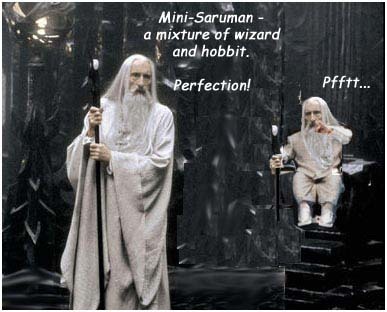 Evidence is given in LoTR: "'But these creatures of Isengard, these half-orcs and goblin-men that the foul craft of Saruman has bred, they will not quail at the sun"
'not his worst' here refers to cross-breeding of Men and orcs, which is his worst deed. I have to conclude vice-versa is also impossible, so taking away the soul, f�a, already in existence is as impossible as giving one to a "golem" created. The Elvish-orcish f�a has the right of Elvish ones to go to Mandos, therefore having the possibility to repent. The decision to rebuild its hr�a lies with the Valar, though usually the f�a is supposed to be kept in captivity till the end of the World. On the other hand, it has the right to refuse the summons and remain in the Hither Lands as a houseless ghost or wraith. But, since Tolkien himself stated that no creature (with the possible exception of Morgoth [and Sauron]) is irredeemable, I may speculate further and assume that there always remains a possibility (however minor) of an orkish f�a repenting. Then, speculating again, one may assume it may be allowed and be provided with a rebuilt hr�a, which, naturally, would equal the state of a repenting f�a and be not of an orc, but maybe similar to what was once original concept - Elven bodily form. The entries 6-12 seem self-explaining to yours truly, so will stand as they are and need not be discussed separately.